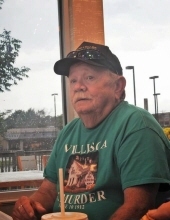 David A. Burch, 67, of Montezuma and formerly of Grinnell, died on April 3, 2019, at Montezuma Specialty Care. A Celebration of Life will be held from 12:00 noon to 4:00 p.m. Sunday, May 12th, at the Diamond Lake Park Main Shelter. Memorial contributions may be designated to the David A. Burch Memorial Fund. David was born on December 3, 1951, in Grinnell, the son of Beverly and Willena Jochims Burch. He was raised and educated in the Poweshiek County area. He was united in marriage with Margaret Zumwalt on September 6, 1972, in Polson, Montana. They were later divorced and he was later married to Kathleen Hoover in Grinnell. For many years, David drove a truck over the road and later with Heishman Farms hauling grain. He enjoyed camping and fishing, drag racing events at Eddyville, country driving, ghost hunting, and trains. He held a passion for collecting Mickey Mouse memorabilia and was a love for Chevy cars. He was an avid fan of country music. David is survived by his six children, Julia Riddell of Montezuma, David Riddell of Grand Rapids, Minnesota, Jim Riddell of Montezuma, Anthony Riddell of Nashwauk, Minnesota, Jessica Engelbrecht of Monroe, and Steven Burch of Grinnell; four brothers, John Burch of Montezuma, Edward Burch of Montezuma, Kevin Burch of Grinnell and David Norman of Loves Park, Illinois; one sister, Diane Hill of Grinnell; and seven grandchildren. He was preceded in death by his parents; one sister, Linda Norman; and three brothers, Larry, Jeff and Daniel Burch. To send flowers or a remembrance gift to the family of David Allen Burch, please visit our Tribute Store. Guaranteed delivery before David's celebration of life begins. "Email Address" would like to share the life celebration of David Allen Burch. Click on the "link" to go to share a favorite memory or leave a condolence message for the family.